Three-quarters of disabled people have left a shop or business premises because of poor disability awareness or understanding, says a recent report by The Papworth Trust. This shocking statistic highlights that many businesses are not only ignoring the rights of disabled people but are also missing out on the increasingly powerful purple pound. What’s more, when you overlook accessibility issues, you’re putting off a vast talent pool of potential employees. Making sure your organisation appeals to disabled people ensures you have a wide and diverse talent pool of candidates. To attract the talent your business needs, you must provide accessibility options which are comfortable, reliable and easy to use. UK law makes clear that businesses must make reasonable adjustments to allow safe access to all. This mandate covers a wide range of accessibility needs, including impaired mobility, sight and hearing, learning difficulties and mental health needs. When it comes to access for wheelchair uses, using wheelchair ramps is often an easy and low-cost solution. Wheelchair ramps are suitable for a wide range of applications. 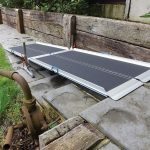 They can be installed as a permanent feature, such as a curb or threshold ramp or perhaps a larger modular system to navigate an entrance point. Alternatively, disability ramps can be used as a temporary measure and can be quickly set up, taken down and stored when necessary. Ensuring accessibility for all doesn’t have to be expensive or time-consuming and solutions don’t need to get in the way of your regular operations. Want to find out more about what it’s like living with a disability in the UK today? Check out the full Papworth Trust report for further stats. If you’d like to discuss your disability ramp requirements with a member of the RAMPCO team, please call: +44 (0) 1920 823940 or contact us online.